Fig. 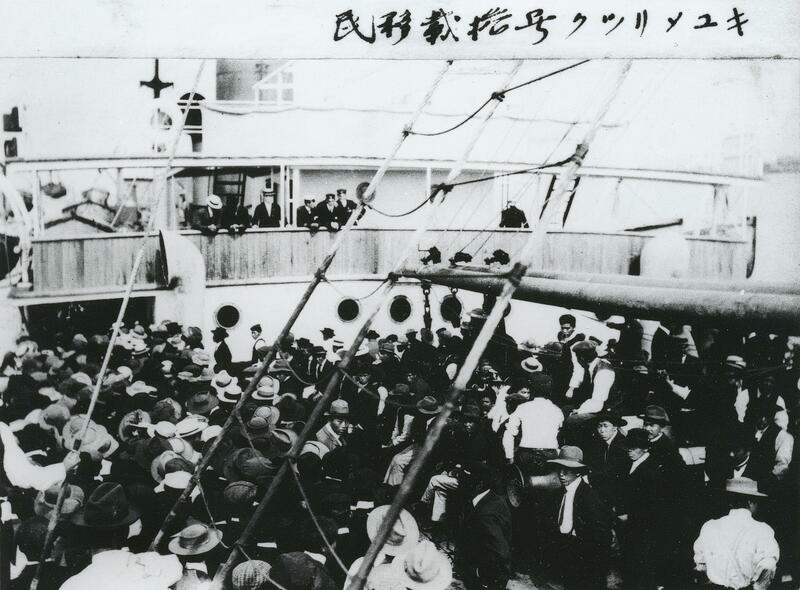 1: Japanese immigrants on board the SS Kumeric at the port of Vancouver, 1907. Source: RBSC, UBC Library: JCPC_36_002b (Click to enlarge, or visit source here). 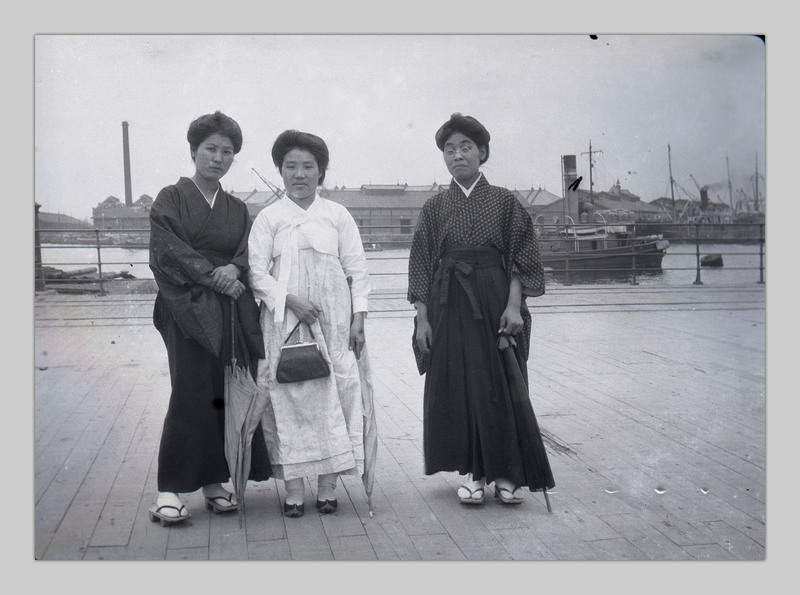 Click here to visit the UBC Japanese Canadian Photograph Collection. Fig. 2: On board the ship. Source: RBSC, UBC Library: JCPC_36_004a (Click to enlarge, or visit source here). Fig. 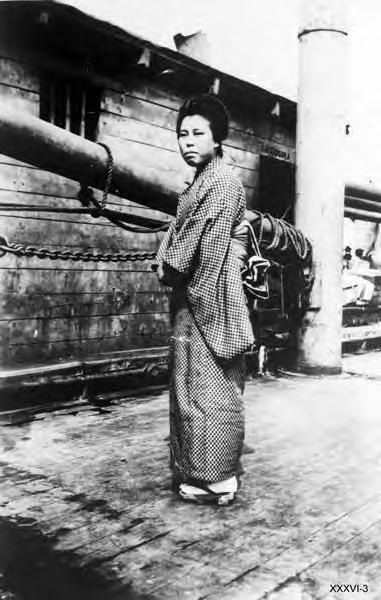 3: Japanese woman on board. Source: RBSC, UBC Library: JCPC_36_ (Click to enlarge, or visit source here). Another showed a Japanese woman dressed in a kimono on the deck [Fig. 3.] And yet another presented the entire body of the 6200-ton vessel [Fig. 4.] The message was clear and provocative. Worse still, the newspapers suggested, this was the tip of iceberg of large- and small-scale movements of issei (first generation Japanese from Hawai‘i), who were allegedly inundating the Pacific shore of Canada and who would force their way into the United States. Fig. 4: Kumeric. Source: RBSC, UBC Library: JCPC_36_002a (Click to enlarge, or visit source here). The circuitous routes of Japanese transmigrants who journeyed from Japan to Hawai‘i, then to Vancouver or Victoria and finally to Seattle or San Francisco, for example, shed light on how determined immigrant labourers were in their search for a better life and how they used their mobility as one of a few assets they could put to use for their pursuit. 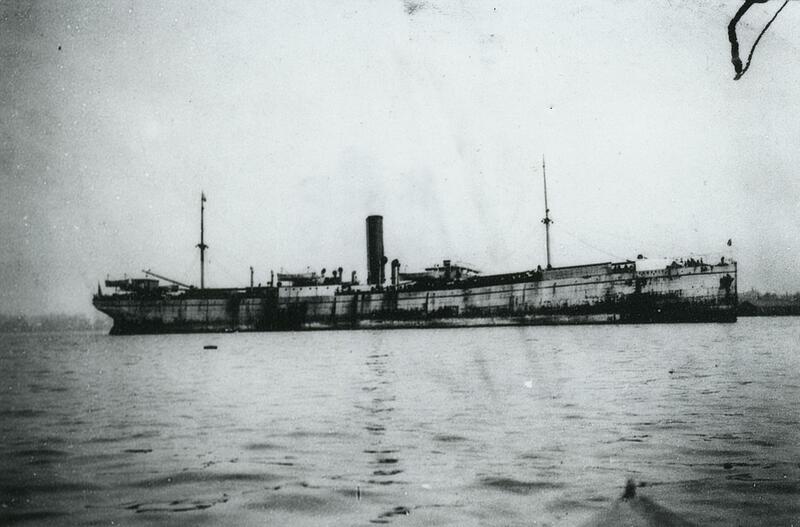 The landing of Japanese on board the Kumeric and several other vessels that preceded or followed highlights the determination of the nation-states, in this case Japanese, Canadian, and American, to curb the mobility of issei workers. Such incidents also indicated the limitations of the measures imposed by state authorities to control such movements. Finally, the roundabout journeys of Hawaiian Japanese illuminates the crucial role that the transpacific steamship companies companies played in challenging or accommodating the regulatory and exclusionary regimes of in- and out-migration that the national governments set up in order to regulate or exclude the movement of foreigners, citizens or subjects considered dangerous, undesirable or inassimilable. Fig. 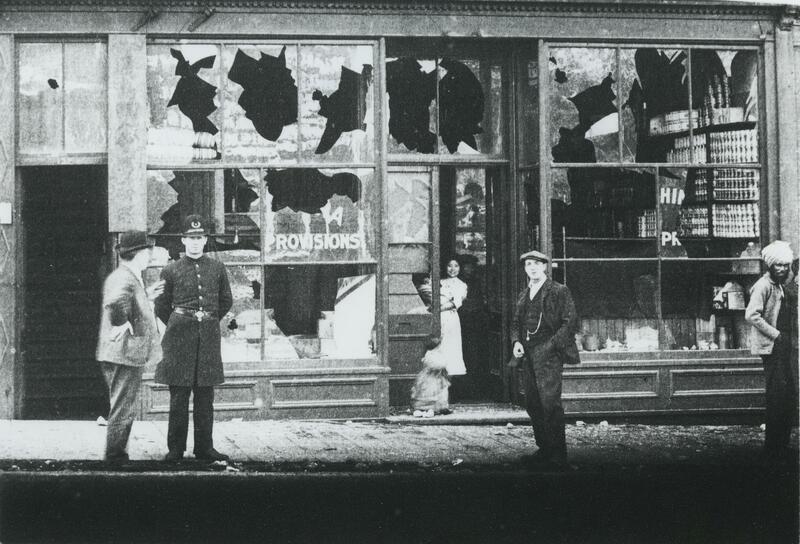 5: Vancouver riot. Source: RBSC, UBC Library: JCPC_36_017 (Click to enlarge, or visit source here). Click here to see more photos of buildings damaged in the 1907 riots. Step migration, or what some historians call the transmigration of Japanese, across the Pacific and towards the Pacific coasts of Canada and the United States took place at a very time when Japan, Hawai‘i, Canada, and the United States were each tightening control over the exit or admission of in- and out-migrants. This was also a period when race relations along the Pacific coast of North America and inland were further deteriorating. It was no coincidence that in 1907, shortly before and after the Kumeric’s arrival in late July, a series of the most violent anti-Oriental riots erupted along the Pacific coast on both sides of the Canada-U.S. border. In the spring, summer and fall of that year, white unionists and residents manifested against Chinese in San Francisco, attacked South Asian workers in Bellingham (Washington) and destroyed the properties of Japanese and Chinese residents in Vancouver. [Fig. 5] (For more, see the Chung Collection; see also photographs of Japanese-owned buildings damaged in the riots here). As early as the late nineteenth century the Japanese Ministry of Foreign Affairs had restricted the migration of Japanese labourers bound for Canada or the United States through the issuance of passports, and it continued to do so in the early twentieth century. In August 1900, the Japanese Foreign Ministry suspended issuance of passports to labourers, male or female, bound for Canada or the United States. The main reason behind the ban was an imminent concern on the part of the Japanese Foreign Ministry about mounting anti-Japanese feelings among the residents of the West Coast of Canada and the United States. The restriction was lifted twenty months later in June 1902 and allowed for former labourers to return and for the reunification of wives and family members. Nevertheless, the regulation of out-migrants (emigration) from Japan continued. The Foreign Ministry restricted the destinations of the emigrants by allowing an emigrant to leave only for the locality listed on the passport. If one held a passport to Hawai‘i, for example, one was allowed to go to Hawai‘i but not to any other destination. In practice, however, Tokyo’s attempt to regulate the mobility of its citizens/subjects through passports and other regulations failed outright. This was because once immigrants went to Hawai‘i, for example, with passports marked “Hawai‘i only,” they passed beyond the jurisdiction of Japan and therefore, its restrictions no longer held any effective power of enforcement. The Canadian and U.S. governments, for their part, also stepped up its efforts to restrict the admission of foreigners deemed undesirable in the first decade of the twentieth century. They did so by implementing in lock step a series of exclusionary laws and regulations designed to prevent the previously little regulated travel of foreigners. By 1908, the U.S.-Japan Gentlemen’s Agreement banned the admission of Japanese labourers while the Lemieux-Hayashi Agreement with the Canadian government severely restricted it. In 1907, President Theodore Roosevelt’s Executive Order 589 barred foreign contract labourers, including Japanese, from entering the United States; and in 1908, Canada restricted step migration through the Continuous Journey Order-in-Council [ii] designed to prevent entry of foreigners unless they travelled directly from the country of birth or citizenship to Canada. 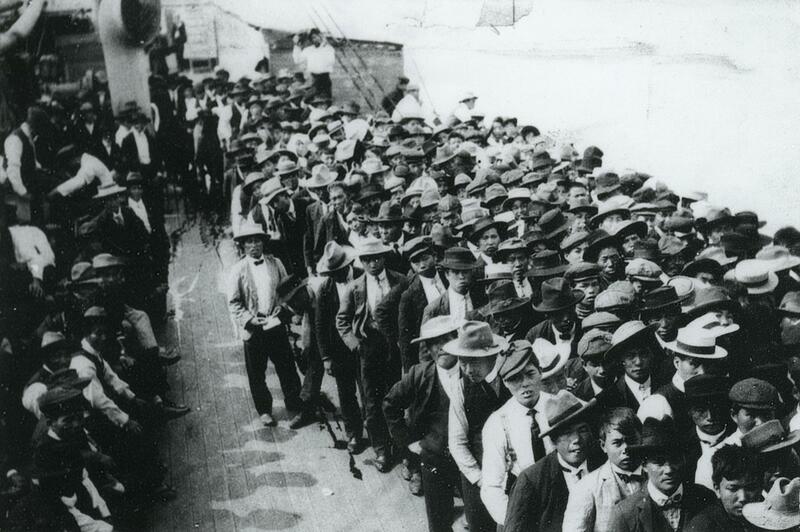 One of unintended results of the exclusionary regime of immigration in 1907 and 1908 was that it left open a window, albeit briefly, for a growing number of issei labourers in Hawai‘i to move to or through Canadian ports. They quickly learned that the passage from Hawai‘i to the mainland United States was now closed with the stipulation of Roosevelt’s Executive Order, but that they could move to Vancouver and Victoria until Canada’s continuous journey clause came into effect. Once they landed in Canada, many stayed there. 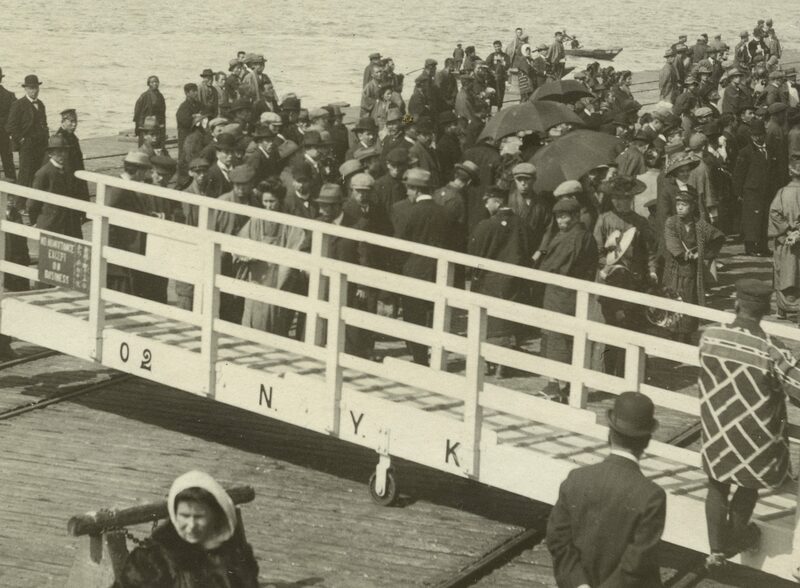 But many others moved on to cross the border into the United States by foot, by train or by a local boat. Like their friends, neighbours, and colleagues who had left for San Francisco or Seattle before the 1907 Executive order, issei cane workers rushed to board transpacific steamers for Canadian destinations. Their transmigration from Hawai‘i to the Canadian ports was propelled by the desire for higher wages, better working conditions, or simply a promise of greater opportunities unavailable in Hawai‘i. Fig. 6: NYK gangboard at the Yokohama pier. Source: RBSC, UBC Library: RBSC-ARC-1757-PH-4434 (Click to enlarge, or visit source here). with three women in the front. Source: RBSC, UBC Library: JCPC_36_002b (Click to enlarge, or visit source here). It was within the context of increasing legal and financial constraints that some transpacific companies directly or indirectly challenged the directives of the U.S. government. One of the most salient protests to the order from the U.S. Bureau of Immigration came from Dodwell & Company and Frank Waterhouse. The U.S. Bureau of Immigration conducted an investigation in 1907 which revealed that almost half of the Japanese (499 passengers out of 1029) disembarking at Victoria were refused the sale of steamship tickets to their destination in the United States and that they were able to secure tickets only to Victoria or Vancouver despite their intention to move on to the United States. Others were “put off” or disembarked at Victoria by a crewmember, despite holding a ticket to a point in the United States. Others still were erroneously told by steamship agents that the vessel did not go to a U.S. destination. On more than one occasion, a U.S. steamer issued a voucher to U.S.-bound Japanese passengers disembarking in Vancouver with a promise of free transportation to their final destination in the U.S. if they applied within ten days. These cases make it clear that the transpacific steamship companies were at the forefront of the transmigration of Japanese, linking multiple sites, be they Hawai‘i, Vancouver, or Seattle, among others, in a way that accommodated or clashed with the will of the national governments to stem the tide of Japanese transmigration. [i] Vancouver Daily Province, July 24 and 25, 1907. [ii] An Act to Amend the Immigration Act, 1908. Ottawa: SC 7-8 Edward VII, Chapter 33. [iii] Drew Keeling, “The Economics of Migrant Transport between Europe and the United States, 1900-1914,” Working Papers, UC World History Workshop, UC Berkeley, November 2005, 8-16. Canada, Royal Commission, Report of W. L. Mackenzie King, C.M.G. Commissioner Appointed to Enquire into the Methods by Which Oriental Labourers Have Been Induced to Come to Canada. Ottawa, 1907. Gaimushô, “Hawai ni okeru Honpô Imin Raiou Meisaisho Shintatsu no Ken,” In Gaimushô Nihon Gaikô Bunsho. Tokyo, 1906. Sasaki, Toshiji, Nihonjin Kanada Iminshi. Tokyo, 1999. Takai, Yukari. “Navigating Transpacific Passages: Steamship Companies, State Regulators, and Transshipment of Japanese in the Early-Twentieth-Century Pacific Northwest.” Journal of American Ethnic History, Spring 2011, vol. 30, no. 3: 7-34. U.S. Industrial Commission, Reports of the Industrial Commission on Immigration: Including Testimony with Review and Digest, The Commission’s Reports, vol. 15, 1901; Repr. New York, 1970. Dr. Yukari Takai is a professor at the Department of History at the University of Windsor and a Faculty Associate at the York Centre for Asian Research (YCAR) at York University in Canada. Born and raised in Tokyo, Japan, she completed her PhD in history at the Université de Montréal in Canada. She is a historian of North America and Asia specialized in issues of migration, women and gender, border and borderlands. 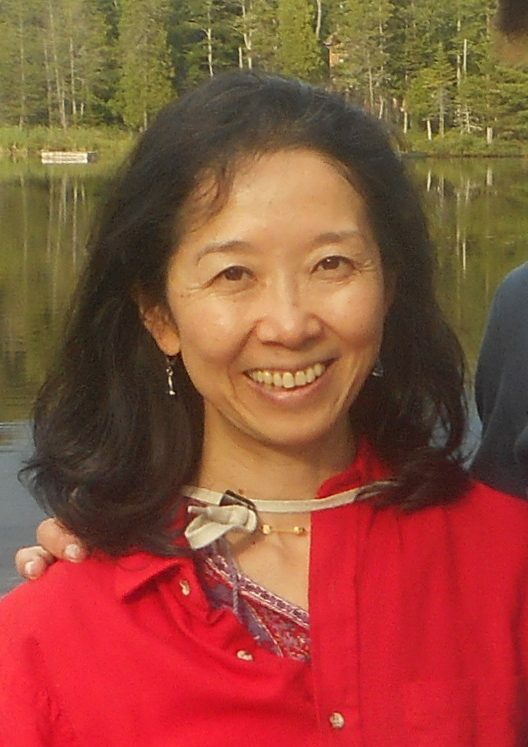 A former Fulbright Research Fellow at Columbia University in New York, Takai is the author of Gendered Passages: French-Canadian Migration to Lowell, Massachusetts, 1900-1920 (2008). Currently, she is completing a book on Japanese transmigration across the Pacific and across the Canada-U.S. border during the Exclusion Era (1882-1941). She is also conducting a new project on the gender and social relations of Japanese in Hawai‘i in the late nineteenth century and the early twentieth century. Dr. Takai is a recipient of grants and fellowships from several organizations, including, among others, the Social Science and Humanities Research Council of Canada, the Japan Society for the Promotion of Science, and the Japan-U.S. Educational Commission (Fulbright Japan).